Grilled meat, usually swordfish, beef, lamb, and lamb with rice and vegetables. This is an excellent addition to summer barbecue. This is Thailand’s most popular salad with pounded garlic and chilies using a mortar and pestle. Then, it is toss in tamarind juice and fish sauce, lime juice, dried shrimps, peanuts, tomatoes, sugar cane paste, string beans and some grated green papaya. Served with sticky rice. Bobotie (pronounced as ba-boor-tea) is a national staple of South Africa. This is similar to Greek moussaka with curried meat casserole covered with a baked cream sauce, dried fruits or nuts. A Middle Eastern spread with chickpeas, lemon juice, garlic, and tahini. This taste so delicious as a dip with meats, bread, beans, vegetables and – Marmite rice cake! This national dish of Singapore is steamed or boiled chicken topped with fragrant oily rice, and sliced cucumber. Variants may include roasted chicken or soy sauced chicken. Dipping sauces can be a premium dark soy sauce, chili, garlic, and pounded ginger. Masala Dosa is consists of crispy rice-battered recipe with a spicy mixture of mashed potato and then dipped in coconut chutney, tomato-lentil based sauces, pickles, and other condiments. Great for breakfast that will keep you going until lunch. It is a dish with hollowed-out half or quartered loaves of white bread with very spicy curry. This food came from the Durban’s Indian community. This is a famous Japanese dish made with monkfish liver which is rubbed with salt, and then washed with sake. The veins are picked out and the liver is rolled into a cylinder shape and steamed. A soup made with shrimps, tomatoes, mushrooms, galangal, lemongrass, and kaffir leaves and then filled with coconut milk and cream. Also called as summer roll, this dish is made from pork shrimps, rice vermicelli, herbs and other ingredients wrapped in rice paper. This is served best at room temperature and dipped in slightly-sweet Vietnamese sauce with ground peanuts. It is a dish made from poached and flaked mackerel, lemongrass, chili, tamarind, mint, pineapple, and onions. It is a Filipino dish made of a whole young pig cooked in slow-roasted over charcoal for hours until the meat is tender and crispy skin. 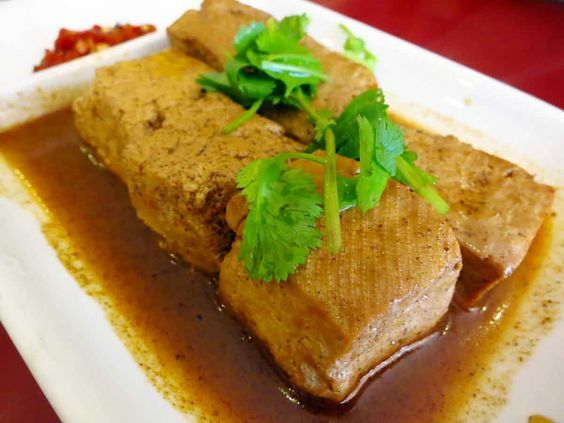 Famous in China, it is a dish of fermented tofu with powerful smell. This is usually sold at night markets or roadside stands, or in lunch bars as side dish. This Hong Kong version of french toast is similar to deep fried hug where two slices of toasts are coated with peanut butter or kaya jam and then soaked in egg batter, fried in butter. This is served best with butter and plenty of syrups. It’s a finger-linkin’ taste of chicken cooked with pepper, lime, garlic, coconut milk and piri-piri sauce. Famous in Indonesia. Beef is gradually-simmered with coconut, mixture of galangal, garlic, lemongrass, ginger, turmeric, and chilies. Then it is left to stew for few hours for a tender and flavorful stew. This dish gets even tastier when it is left overnight.